On 19 December 1694, a contract was signed with the eminent immigrant organ builder from Germany, Bernard Smith, to supply an organ for the new Cathedral of St Paul's which by then was completed up to the point where the East end of the building could be used. 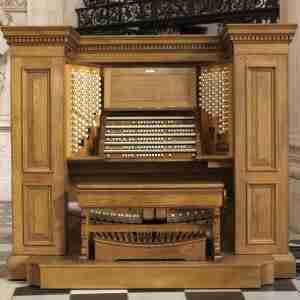 The agreed figure for the new organ was £2,000, at the time quite a substantial sum of money for an organ. It would appear that he was prepared, at his own expense, to increase the size of the instrument beyond that for which he was contracted. In particular, he wished to extend the key compass downwards to include manual pipes at 16ft pitch. 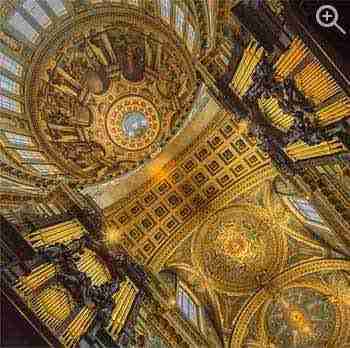 Wren had however already designed the case into which the organ was to be built, and the extra space (which the enlarged compass required) led to the famous altercation between Wren and Smith, the former terming the organ a "confounded box of whistles". The Smith organ was placed on a screen in the Quire as was usual at the time, with both an East and West front. The East facing front had a Chaire case, and the organ had three manuals, the third being a short compass Echo organ, possibly enclosed in a box, but not one that could be opened and closed, of course. In spite of its modest size, being only 27 stops, it remained virtually unaltered until 1830 by which time it must have appeared very old fashioned. J C Bishop made several improvements at around this time but the lack of power displayed by the instrument must have become very apparent with the introduction in 1858 of the Sunday evening service, with its emphasis on congregational participation. This new service, together with the effects of the Tractarian movement, led to the re-siting of the organ in 1860 to a new home behind the stalls on the North side of the Quire. The famous organ builder, Henry Willis, who had established himself with his organ for the Great Exhibition of 1851, carried out minor modifications in 1863 and then went on to build an essentially new instrument for the Cathedral in 1872. Some 200 pipes of the original Smith organ were retained, a handful of which remain in use to the present day. 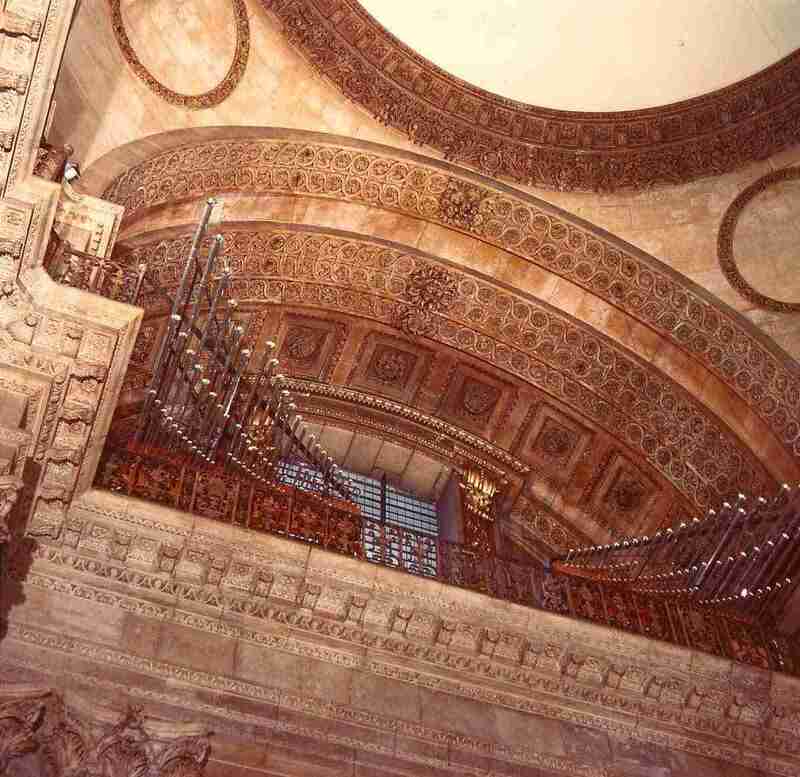 The original Wren case was sawn in half, modified, and placed against the pillars supporting the dome, where they remain. The organ then had four manuals. Father Willis' organ employed the new and ingenious pneumatic action, a system which was to find rapid acceptance and use elsewhere. Clearly, the organ enhanced and confirmed Father Willis' reputation as the pre-eminent organbuilder of his time, but he was keen to carry out further enlargements of the organ. In 1897 and 1900, significant additions were made to the organ. The entire Pedal Organ was moved up into the north-east quarter dome, leaving space behind the Choir Stalls for a new and more modest Pedal Organ together with an enlarged Solo division. 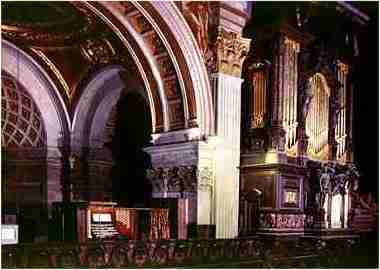 Two additional Open Diapasons were added to the Great Organ, and a four-stop Altar Organ was built and placed on top of the Choir stalls one bay East of the Pedal and Solo. The tour de force must, however, have been the introduction of a family of Solo Tubas, placed in the quarter dome. None of this would have been possible without the use of electric action, pioneered by Father Willis at Canterbury Cathedral some years earlier. 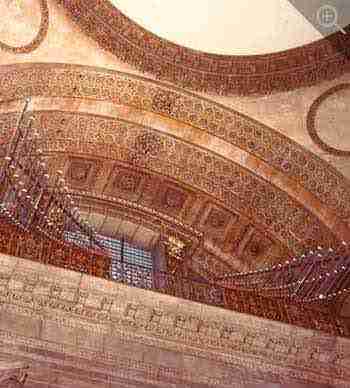 In 1925 the instrument fell to the consequences of the discovery that the dome was in danger of collapse. The organ was dismantled and re-erected in the north nave aisle, with the Wren cases once more being modified. The organ was moved back to its usual home in 1930, together with the new console which had been built for it. By now the instrument had electric action throughout, and a few useful additions were made including enlargement of the modest Chancel Pedal section, a third 32ft stop in the pedal and the introduction of the "Willis" Trompette Militaire. This stop was in fact imported from America where it was a common feature in theatre organs. During World War II, the organ was dismantled for safe keeping and stored in the Crypt under the North Transept, the very spot where an unexploded bomb came to rest, having crashed through both the roof and Cathedral floor. Significant damage resulted, but thankfully mostly restorable. Soon after the war the organ was re-instated. The astonishing effect of the Dome Tubas and Trompette Militaire had not gone unnoticed, and it was decided to try something similar with a dome chorus. A chorus of Lewis pipework salvaged from a bombed London church was installed in the south-east quarter dome and, unsuited as the pipework was for such a large building, it was effective in offering greater encouragement to congregational singing. The organ received some remedial work in the 1950s and 1960s but the material was fast reaching the point where something more radical was required. In the late 1960s, a committee was formed by Christopher Dearnley, including the then surveyor to the Cathedral, Bernard Fielden, and Cecil Clutton. A number of options were discussed, including the possibility of reinstating the organ onto a restored screen close to its original position. This ambitious scheme was not undertaken but an almost as ambitious re-appraisal of the organ and its strengths and weaknesses was, which resulted in the instrument as it stands today. Efforts had been made in the past to increase the effectiveness of the organ in the nave, somewhat to the detriment of the original Willis work. It was now recognised that these attempts were misguided. The partial effectiveness of the dome chorus was however noted, and it was decided that a new and more generously scaled dome chorus should be built to cater for the requirements of the congregation under the dome and at the front of the nave, aided by a new west chorus to assist the singing at the back of the nave. This allowed the Chancel organ to concentrate on that at which it excelled, the accompaniment of the choir and for services in the Chancel. The Great Organ was reduced to a state closer to its original 1872 specification, with the addition of a quint mixture for use where the Willis tierce mixtures were less suitable. The usefulness of the Great Organ was enhanced by a new north choir section, scaled and voiced to act as a happy extension of the Willis work, releasing the south choir to continue its prime role as an accompanimental division. The north choir occupies the space which up until then had been reserved for the console, and a new console was placed above the south choir stalls. The Swell Organ, as is so often the case in such instruments, had emerged almost entirely unscathed from the vagaries of changing fashion, but a Vox Humana was added for extra colour. Those parts of the organ behind the north choir stalls, the Solo and Chancel Pedal, were rearranged to improve egress, and the Chancel Pedal, which had undergone successive changes in an effort to improve its effectiveness, was entirely remodelled and enlarged to provide a more effective and independent Pedal department to complement the rest of the Chancel organ. The most visible addition to the organ was the provision of three new west Trumpets on the gallery high above the West door. These were intended for occasional use for special services and royal occasions but have found favour with many recitalists as well. Few are the Celebrity Recitals where they do not receive an airing. The rebuilding work started in 1972 and was completed in 1977 in time for HM The Queen's Silver Jubilee. All new soundboards (with exception of that of the dome tubas) were employed, as well as a new console and action and new reservoirs. Throughout the re-building programme, the majority of the organ was in operation. Even the change from the old console to the new was achieved between evensong of one day and the next! Minor works have been undertaken on the organ since its 1970s re-build. A multiple-level capture system has been installed, and a new Willis-style Claribel Flute has been re-instated on the Great Organ in the place of the Choir Principal which had been moved to the Great in 1930. The south choir has regained its Principal, together with a Bourdon 16, a Flûte Harmonique 4 and a Corno di Bassetto. The organ was cleaned in the 1980s but apart from this there has been little call for any further changes, which has to be a tribute to those primarily involved in the work of the 1970s (Christopher Dearnley, the late Cecil Clutton, Noel Mander and Ian Bell) in the thoughtful search for a solution which would satisfy the musical demands of the Cathedral whilst respecting the historic material of its organ. Update, October 2010 More recently, the entire organ was cleaned, and some re-leathering work was carried out. As part of this, a new mobile console was installed for playing the organ under the dome. This entailed installing a new transmission system for the action and an upgrade of the capture system. Very little tonal alteration was undertaken, but one exception was the replacement of the Dome Tubas and Dome Trumpet and Posaune with new pipes. These had deteriorated to the point that further repair was uneconomical, and their tone suffered as a result. The new stops have been well received and added a sparkle to the Dome section which is most welcome.